The press conference begins. Suvarov speaks briefly. Dalia smiles nervously. Omar is looked upon as a hero. After the press conference concludes, the U.N. rep says that there is no time for questions. Suvarov asks President Taylor about Dalia’s cold demeanor. Allison says that Dalia is still grieving Omar’s death. Suvarov realizes that Allison told Dalia about his involvement. Suvarov can’t believe that Allison blackmailed Dalia. Charles talks to Suvarov. Charles asks Yuri to meet him at his suite, since there is a “possible leak” in his camp. After the phone call, Charles asks Jack if he sounded convincing. Charles doesn’t think that killing Suvarov will change anything. Chloe awakens. Chloe tells Jack that they can send the video file to all media outlets. Cole tries calling Chloe but he is getting her voicemail. Cole looks at his watch and radios to Burke. Cole instructs Agent Burke to get his men to the building across the street because Bauer is there. Chloe tries to reason with Jack but he won’t listen. Chloe is saddened that Jack would kill Suvarov, claiming it would be looked upon as an act of war. Jack watches as Suvarov enters Logan’s suite. Chloe asserts that Renee wouldn’t want Jack to avenge her death. Chloe begs Jack to rethink this. Jack starts crying as he sets his sights on Suvarov. Thankfully, Jack changes his mind and drops the gun. Logan senses that Jack isn’t going to shoot Suvarov. Logan tells Suvarov that he just received word that there is no leak. Suvarov is irritated by Logan. Suvarov leaves the suite. Logan tells his aide to find Jason. The agents enter the building. Jack gives the recording to Chloe. Jack wants Chloe to shoot him. Chloe won’t do it. Jack threatens to pull the trigger himself. Chloe shoots Jack right as the agents barge in. Jack is down. Cole gets a call from Chloe. Chloe has a recording showing Logan’s involvement. Cole and Chloe wonder if Jack will survive. Jack is in and out of consciousness. Burke tells Chloe that she’ll be debriefed there. Chloe looks defeated. Jason is on the phone with Logan. Logan relays that Jack recorded their conversation. Jason tells Logan to relax. Logan worries that his life will be destroyed if the recording is released. Jason enters the room and glances at Jack. Jason searches the room but can’t find the recording. Burke and Jason talk in private. Jason wants to find the data card as soon as possible. Jason figures that Jack gave the card to Chloe. Chloe denies it. However, Jason has to search Chloe. Chloe is embarrassed. Chloe quickly leaves the room and gets on the elevator. Unbeknownst to Jason, the data card is inside Chloe’s phone. Jason is panicking since he can’t find the card. Jason leans down to hear Jack, who is mumbling. Jack bites off Jason’s ear. Chloe hands the data card to Cole. Cole begins uploading the file but agents show up. Burke places a call to Jason and says that he has the data card. Chloe and Cole will be transferred to CTU lockdown. Charles heads to Allison’s office. Charles hands over the data card. Logan wants the recording destroyed. Logan reminds Allison that she needs to protect herself. Logan warns that Jack will stop at nothing to have the truth revealed. After Logan leaves, Allison listens to the recording. Allison is deeply affected by Jack’s words. Allison receives word that the signing will begin soon. Jason and Charles are confident that Jack will be dealt with. Charles is impressed with the President. Jason and Logan return to the suite, where they propose a toast. At the signing, Dalia is glaring at Suvarov. Dalia whispers to Jamot that she can’t wait for the signing to be over. When the President arrives, everyone claps. Allison shakes Dalia’s hand. The U.N. rep speaks to the press. He welcomes the three presidents. A copy of the agreement is placed in front of Suvarov. Suvarov quickly signs the document. Dalia is next. Dalia hesitates to sign but then finally relents. Allison picks up the pen that was Dalia’s gift. Allison is about to sign but then slowly puts down the pen. Allison announces that she is part of a cover-up. Allison asserts that the peace process cannot go on. Everyone is speechless. 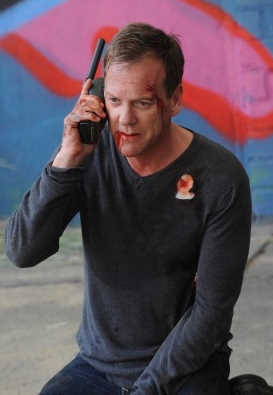 Afterwards, Allison tells Tim that Jack Bauer’s life is in jeopardy. Allison worries that Jack will be ambushed on the way to the hospital. Tim can’t believe what he’s hearing. Allison fears that Jack is already dead. Jack manages to crawl his way out of the ambulance. However, some agents show up and cover his face with a mask. Jason and Charles realize that they are finished when they see Allison’s announcement on television. The phone rings but Charles doesn’t want to answer it. Jason tells Charles that “it’s over”. Before Jason can answer the phone, Charles knocks him out. Charles shoots Jason in the head. Allison knocks on Charles’ door. Charles doesn’t hesitate to shoot himself. Allison knows that they need Charles alive since he is aware of Jack’s location. Logan is barely alive. Tim tells Allison that Logan will probably be brain-damaged if he survives. Allison wants to call CTU. Tim relays that he had Cole and Chloe released from custody. Allison thanks Tim. Eden is arrested. Chloe and Cole are shocked that the President didn’t sign the agreement. Arlo finds the feed from Jack’s ambush. Chloe discovers a real-time feed of the van pulling up in an alley. Chloe wants to send units to the location but there’s no time. The agent uncovers Jack’s face. The man agrees to make Jack’s death a quick one. Jack isn’t impressed. Jack kicks the man. However, the agent manages to knock out Jack. Another man yells out that they have just received word from President Taylor. Allison wants Jack released. The man uncuffs Jack and hands him the walkie-talkie. The men drive away in the van. Jack tells Allison that she should have killed him. Allison confides that the treaty wasn’t signed. Allison explains that she’ll be resigning from her position as president, as well as facing criminal charges. Allison apologizes for not listening to Jack from the beginning. Allison advises Jack to leave the country since everyone will be hunting him down. After hanging up the phone, Allison looks over at Tim. Chloe is crying. Jack calls Chloe. Jack asks Chloe to keep an eye on Kim and her family. Jack thanks Chloe for remaining loyal through the years. Chloe starts to sob. Chloe wishes Jack good luck. Chloe tells Cole and Arlo to forget what they saw on the feed. Jack stands up and runs down an alley. Jack looks into the camera one last time.